At night the roadside landscape can be a beautiful scene. Imagine a boulevard full of roadside motels lighting up their marquees as the sun sets, one by one. Orange County is home to a couple of theme parks. With them come tourists in search of sleeping accommodations. To catch their eye, good unique neon signage can still be spotted off the road at times. 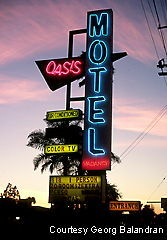 See some of them here at Roadside Peek's Orange County Neon Motels. Here's a nice neon shot of the Bayshore Inn Motel. The Silver Saddle Motel is still open for business with its neon sign lit up for potential travelers. The Sunset Palms Motel glows at night for those passing down Sunset Boulevard. Although the streets have been cleaned up quite a bit from a couple of decades ago, small treasures such as this one still light the memory of Sunset Boulevard's past. 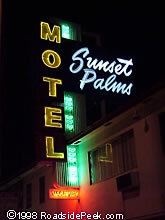 To see more motel neon treasures, check out Roadside Peek's Spotlight on the Sunset Palms Motel. 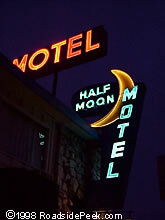 The Half Moon Motel brightens up the sky here. 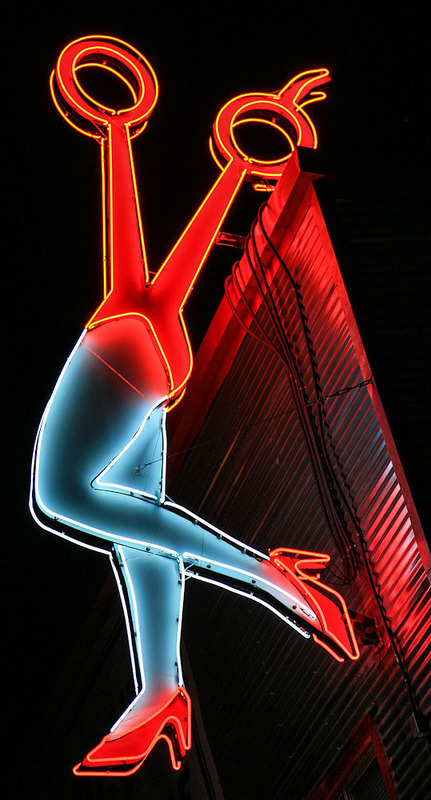 This is one of the first neon photos ever posted to Roadside Peek. Another hardy veteran of Roadside Peek display, the Topper Motel unfortunately has lots its hat in more recent iterations. 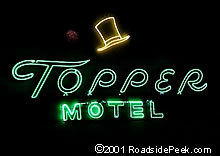 Now how can one have a Topper sign with out a top hat?